Click on any name to send an email to the person..
6 Nov 16 - The November Rabble is posted. 27 Oct 16 - The newsletter page is up to date. 17 Aug 16 - The NOR for the Des Plaines regatta is posted. 21 Apr 16 - The16RabbleApril.pdf is now in the Newsletters menu. Check out the above link for information on this summers National Regatta. 11 Jan 16 - The Constitution and ByLaws have been revised to include the new mast section. 7 Sept 15 - Put the May 2015 Rabble online. Sorry, I forgot to do this. 25 Apr 15 - Updated the Invitation and added the news form Kevin. 27 Mar 15 - The March Rabble can be seen on line. 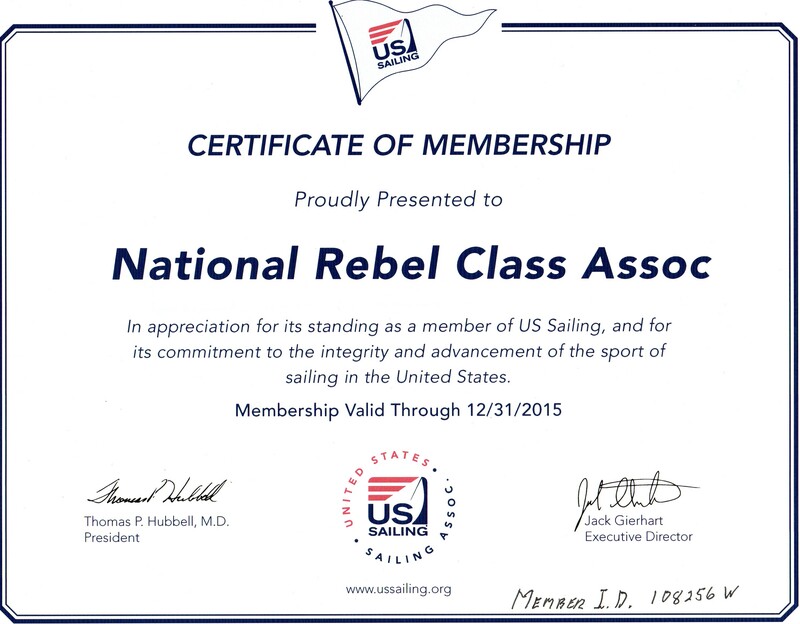 18 Feb 15 - The 2015 US Sailing Certificate is posted. 31 Jan 15 - The 2015 Nationals info is now available. See above. 9 Jan 15 - The dues notice has been updated for 2015. We now have the ability to pay on-line. 1 July 14 - See photo from Des Plaines regatta below. 29 Jun 14 - Added 2014 Nationals NOR. 22 Jun 14 - Posted Des Plaines NOR. 18 Jun 14 - Rebel 3444 is for sale. 1 May 14 - The May Rabble is now available. Thanks Bruce. 24 Mar 14 - Dave Nichols got snowed in and made an improved line drawing shown on the left. Thanks Dave. Notice it is now green. 22 Mar 14 - Rebel 4014 is for sale. See photos and info on the Buy/Sell page. 13 Mar 14 - Various updates. 30 Nov 13 - Add the photo below from the Grand Rapids regatta last summer. Thanks to Mary Vorel for the names. 27 Nov 13 - Found this video on uTube. 24 Mar 13 - Here is the March Rabble. 12 Feb 13 - The latest enews from Bruce is below. He has important information on succession planning, regatta schedules, and promotion of our class. 4 Jan 13 - Updated information, forms, contacts, & links for 2013. 11 Dec 12 - The Buy/Sell page has been updated. 25 Nov 12 - The latest enews from Bruce has important information about 2013 Nationals. Bruce also discusses the summer full of regattas and how to incorporate the Collegiate Challenge into the schedule. 5 Nov 12 - Bruce Nowak did the November Rabble all in pictures. It is spectacular. Thanks to Bruce for his extra work doing this. 4 Nov 12 - A video of the 1992 Rebel Nationals at Lake Springfield, IL by Lud Fromme is now available on line. About 12 minutes. 27 Oct 12 - Clarence Metzger found this video done by a TV station filming the 1979 Rebel Nationals in Dallas. 12 minutes long. 19 Sept 12 - Scott Wright shows us how to do a single handed stepping of the mast. Many of you have been asking for this. 18 Aug 12 - Uncle Al has completed his photo reviews of the Junior and Senior Nationals. 12 Aug 12 - Bruce has sent an updated enews and a Ver 3 of the the August Rabble. 5 Aug 12 - Bruce updated the enews and published the Aug/Sept Rabble. Jim Quiniff has sent a report and results of the Des Plaines Regatta. Below is a group photo of the sailors. 26 July 12 - Get caught up to date with the latest e-news from Bruce below and catch the August Rabble. 14 July 12 - 2012 National Race Results are in. 6 July 12 - The July Rabble is now available and Bruce also updated the e news. 13 Jun 12 - Bruce just updated the e news below. 7 Jun 12 - Bruce & Sharon did a fun video of the Bayview One Design regatta. 24 May 12 - Check out the latest news from Bruce. 21 May 12 - Our 2012 US Sailing Certificate of Membership is now available on the Class Information page. 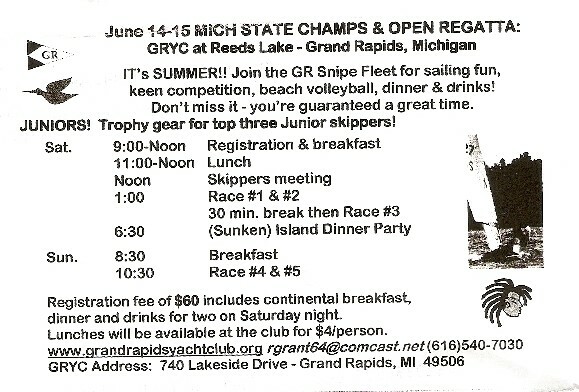 11 May 12 - Added a link to Sail Michigan on the Sailing Links page. 6 May 12 - A major rewrite of Mark Quiniff's article on Rebel models is now available. 3 May 12 - Bruce updates this summers events. Check them out. 23 Apr 12 - See e-news from Bruce. This is a good summary of this summer's events. 14 Apr 12 - John Vanden Brink's Rebel 4196 is for sale. See the Buy/Sell page. 11 Apr 12 - Everything you wanted to know about the Rebel Nationals is linked here and on the Events page. 11 Apr 12 - Rebel wanted ad to the Buy/Sell page. 4 Apr 12 - The April issue of the Rebel Rabble is now on line. It has all the information about this summers Nationals that you need. 25 Mar 12 - Dave Nickels shows us how to put a split bridle on a Mark IV. 15 Mar 12 - Check out the new update from Bruce. 27 Feb 12 - Latest e-news from Bruce. A summary of important dates. 14 Feb 12 - Revised Rebel parts ad from Hank. 29 Jan 12 - The Jan 2012 Rabble is now available. See the new North Sails ad. 22 Jan 12 - Bruce Nowak sends his latest enews. He has some interesting proposals. 2 Dec 11 - Posted the passing of Lee Nowak. 6 Nov 11 - The Buy/Sell page has the new Hodgson ad. 5 Sept 11 - The Buy/Sell page is updated with the Vermont Sailing ad and the Hank Hodgson ad. 5 Sept 11 - Posted the last three Rabbles on the Newsletter page. Included is the Sept Rabble which covers the 2011 Nationals. 3 Aug 11 - Sailors from the Des Plaines regatta shown below. Thanks to Jim Quiniff the results are also posted. 28 July 11 - Here is the latest e-news from Bruce. 27 July 11 - The NOR for the Des Plaines regatta on 30/31 July is available. 11 July 11 - Started posting results of the Nationals. 6 July 11 - Updated Nationals information. 21 Jun 11 - The dues form has been updated. 6 May 11 - Added a link to the National Sailing Hall of Fame. 19 Apr 11 - Updated Buy/Sell page. 25 Mar 11 - Rebel 4170 ad posted. 5 Mar 11 - Updated Events page. 12 Feb 11 - Sails needed ad posted on the Buy/Sell page. 5 Feb 11 - See the latest enews from Bruce below. 26 Jan 11 - Updated the Events page with regatta info we have to date. 24 Jan 11 - The January Rabble can be viewed from the Newsletters page. 11 Sept 10 - The September Rebel Rabble is now available on the Newsletters page. Added a group photo from the Des Plaines regatta. Scroll down. 3 Sept 10 - Al Schonborn has completed the 2010 Nationals in pics on the Photos page. Mark & Jim Quiniff have updated & added photos to the History of Rebel Versions over the Years. This document will help us identify our boats & shows the evolution over the years. Thanks to Mark & Jim. 20 July 10 - Rebel Junior scholarship application is on the Class Information page. 7 July 10 - East Coast Districts on Greenwood Lake have been added to the Events page. The July Rabble is now available on the Newsletters page. Date of the Des Plaines regatta are now Aug 7 & 8. 8 May 10 - Our Rabble editor, Bruce Nowak has posted a new Sailing News below. 21 Apr 10 - Bruce has sent the latest sailing news. See below. The April 2010 Rabble is now available on the Newsletter page. There are new ads on the Buy/Sell page. Used sails are always wanted. Members can advertize for free in the Rabble and the on the web site. 1 Apr 10 - A history of Rebel versions has been added to the Articles page, Thanks to Mark Quiniff. 28 Mar 10 - Added patches and decals to the Buy/Sell page. Take a look, they are great. 18 Mar 10 - New ads on the Buy/Sell page. Check out the new North Sails ad. 7 Mar 10 - Bruce has news from the Spring Meeting below. 6 Mar 10 - The schedule for the 2010 Nationals and several regattas have been updated on the Events page. 22 Feb 10 - Bruce posts the latest e-news. 4 Feb 10 - Removed Racing Rules Forum. 3 Feb 10- The Jan 2010 Rabble is now available on the Newsletters page. 21 Jan 10 - Plans to build the wooden cup holders in the Mark IV are now available from a link on the Articles page. 5 Jan 10 - Bruce sends the latest e-news. 26 Dec 09 - Des Plaines photo added below. 15 Dec 09 - Updated Join the NRCA form. 5 Oct 09 - Latest e-news from Bruce. 5 Sept 09 - The Sept Rabble is out. Bruce did a great job with the photos on this issue. 3 Sept 09 - Bruce sends his latest e-news. 30 July 09 - Get the NOR for the DPYC Rebel Invitational here. 24 July 09 - All results of the 2009 Nationals are now posted. Also see the latest e-news from Bruce below. 14 July 09 - The results of the 2009 Junior Nationals are posted. Congratulations to winners Gage Hudak & Anthony Rinehart. 5 July 09 - The July Rabble is ready to view. 30 Jun 09 - 2009 Junior Nationals form & requirements are now posted. 20 May 09 - Latest e-news from Bruce. 17 May 09 - The May Rabble is posted and the NOR for the 2009 Nationals is now ready. 25 Mar 09 - Added the Sailors' Tailor to the links page. 10 Mar 09 - Added a link to the CleverPig sailing web site on the Sailing Links page. The Rebel Nationals will be July 12/17, 2009. 24 Jan 09 - The Jan 2009 Rabble is available on the Newsletters page. 4 Dec 08 - Bruce has sent a new e-news for December. 3 Nov 08 - Still more decals. Let's hear from you. 1 Nov 08 - Bruce has updated the e-news. We need your input on a new decal. I just added proposal from Dave Nickels. 7 Oct 08 - See the new e-news from Bruce. 16 Sept 08 - Posted the Sept 08 Rabble on the Newsletters page. 13 Sept 08 - Updated the Buy/Sell page with additional ads from the latest Rabble. Added historic Rebel production brochures on the Articles page thanks to Mark Quiniff. 11 Sept 08 - Sept e-news from Bruce is posted below. 19 Aug 08 - Received results of the DPYC regatta from John Washburn & ODCC Newsletter from Bruce Nowak. 14 Aug 08 - E-news from Bruce with photo from Des Plaines regatta. 18 July 08 - 2008 National results. Both juniors and seniors. 10 July 08 - A new e-news from Bruce. See below. The previous two are still posted. 8 Jul 08 - The June 08 Rabble is now available on the Newsletters page. 30 Jun 08 - Added the latest e-news from Bruce below. Left the one from the previous week since some folks have not seen it. 23 Jun 08 - Updated the e-news from Bruce. See below. 21 Jun 08 - The Notice of Race for the Des Plaines Rebel Invitational is on the Events page. 4 Jun 08 - Posted the Notice of Race for the GRYC Open Regatta. 28 May 08 - Added the April Rabble to the Newsletters page and updated the Events page. 19 May 08 - Bruce has updated the e-news. See below. 12 Apr 08 - Added the Allan Vorel business card on the Buy/Sell page. 10 Apr 08 - Posted the New Jersey Districts on the Events page. 19 Mar 08 - Added links to the 2008 nationals registration forms, maps, lodging & camping information and racing instructions on the Events page. 16 Mar 08 - See the latest e-news from Bruce. (Scroll down). 25 Feb 08 - The schedule for the 2008 Nationals at Lake Fenton is now available on the Events page. 17 Feb 08 - August 9/10, 2008 are confirmed for the Des Plaines Invitational on the Events page. Thanks Mark. 5 Feb 08 - Added a link on the Sailing Links page to "The Physics of Sailing" sent in by Randy Clore. 5Feb 08 - Posted Bruce's latest e-news and added a link to the Racing Rules forum. 30 Jan 08 - Revised the "Articles" page & added a method to search for information on this site at the bottom of the page. 19 Jan 08 - Posted the latest e-Rabble news from our editor Bruce Nowak. 17 Jan 08 - Published the minutes of the July 07 NRCA Board Meeting on the Newsletters page. 15 Jan 08 - The Notice of Race for the CLYC Dowling Regatta is available in the Events page. 3 Jan 08 - Added the Spring Meeting time and date to the Events page. Added Dave Nickels as Vice Commodore to the Contacts page. Put a link to the Sailing Magazine article on refurbishing an old Rebel on the Articles page. 2 Jan 08 - The January 2008 Rabble is available on the Newsletter page. 27 Dec 07 - Firm dates for the 2008 Grand Rapids Open are posted on the Events page. A link to Sailing Magazine has been added to the Links page. The Jan 08 issue features the Rebel as one of the boats they retrofit. 12 Dec 07 - Added E-Rabble News from editor Bruce Nowak above. 7 Dec 07 - Added 2008 regattas to the Events page. 11 Oct 07 - Posted results of the CLYC fall regatta on the Results page. Also added the Sept 07 Rabble to the Newsletters page. 1 Sept 07 - Added R1654 for sale ad and deleted "Free Rebel" ad on for Sale page. 15 Aug 07 - Posted results of the Des Plaines Invitational regatta. 2 Aug 07 - Added Al's Nationals in pictures and update "Where to Sail" and "Contacts" pages. 31 July 07 - Posted results from the 2007 Nationals and the photos on the home page. 23 July 07 - Added Sat and Sun from Bruce and Sharon Nowak. 21 July 07 - Put a link to Rules in Photos on the Photos page. 13 July 07 - Updated this home page and the photos below. 20 Jun 07 - Posted the June Rabble on the Newsletters page and added notes to the home page. 13 Jun 07 - Updated this Home page. 23 May 07 - Added the April 07 Rabble to Newsletters. 12 May 07 - Updated this Home page. 16 April 07 - Removed the sails wanted ad. 4 April 07 - Put the Jan 07 Rabble on the Newsletters page. We will put more Rabbles on the web site if there is interest. Let me know. Removed Sailors World ad and added sails wanted - see Items wanted & for sale. 25 March 07 - Put spring meeting on the home page. Corrected Karel Vorel email on the "Contacts" and "Events" pages. Added the nice buttons to the "Where to Sail" page. 5 March 07 - Updated the home page (see photo below) and deleted the Hodgson ad. Added detail about the Spring Meeting. 1 Mar 07 - Added link to NavQuest, a new marine navigation map source. 19 Feb 07 - Added the nice buttons to the Boats & Parts for Sale page and added the ad for a free Rebel from Hugh Gillespie. 24 Jan 07 - Added the note about the Nationals and the Spring Meeting. 6 Jan 07 - Added the picture below & reversed the order of What's New. Eliminated the opening graphic. Added archive for older What's New items on Contacts page. 5 Jan 07 - Corrected Rebel Nationals dates in Events (thanks Al). Added Hodgson ad in Boats & Parts for Sale. 20 Oct 06 - Added link to 2003 Nationals. 19 Oct 06 - Corrected 2006 senior results and added junior results. (Thanks Bruce). 16 Oct 06 - Update Site Map with new events. 15 Oct 06 - Complete redo of Events page with added content on past Nationals. 27 Sept 06 - Added this "What's New" area. 14 Sept 06 - Web site completely reorganized. New pages added to make it easier to find things. 1 Feb 07 - Updated the Events page to use the nice buttons shown above and added the Des Plaines & Grand Rapids invitationals. 25 Jan 07 - The invitation for the 2007 CLYC Invitational is now posted. Thanks Patti. Ya all come. 1) Racing Rules Discussion Board. Thanks to our ever brilliant WebSkipper, Neil Robb, a fortuitous book purchase at the ODSS Symposium by me and the permission of US SAILING and David Perry we are able to bring you Dave Perry’s 100 Best Racing Rules Quizzes one or two questions at a time on our website. What we plan to do is provide you the facts as Dave wrote them and let everyone take a shot a being a member of the protest committee. After 3 weeks or so we will then post the answer given in Dave’s book for everyone to compare. Neil believes we should be ready to give it a go on February 1st. 2008 and we hope you are as excited as Neil and I are. We are also inviting everyone to submit their own situation as a quiz so that we may then discuss it as a group on line. There should (will) be a discussion forum button on our website specifically for these submissions. Finally, we are planning to update the discussion board the 1st of each month excepting our busy sailing season. 2) www.rebelsailor.com Our WebSkipper also has been very busy updating the schedule on our website. So far we have two June regattas one in Grand Rapids on the 14th and 15th followed by Rock Hall on the 21st and 22nd. Of course the Rebel Nationals are in Lake Fenton with the Junior Nationals beginning on July 13th. If tradition holds in Des Plaines then expect their regatta to occur on August 9th and 10th. Clark Lake will hold their invitational on the weekend of September 20th and 21st. The best part of using our website is that each of these locations has a hot link to it, so you can just grab the registration info and go. Most excellent! 3) July 2007 Meeting Minutes The gremlins have finally given the meeting minutes back to Karol and we have posted them on the website under ‘Newsletters’ in lieu of waiting till April to publish them in the Rabble. 4) 2008 Spring Meeting The NRCA Spring Meeting will start at 10:30 on February 23, 2008 at the Grand Rapids Yacht Club. A lunch will be available and the Commodore thinks we should be done by early afternoon. 5) Junior Photographer Sharon, Lee, Irene and I will not be at the Nationals on Sunday as Irene’s brother Al and his wife Agnes are celebrating 50 years of marriage on July 13th. The Rabble needs a volunteer to take pictures of the day’s events, especially the junior races. As we are planning to drop our boat on Saturday the 12th, we can leave our Kodak with its docking port for a prearranged pick-up. Yea, I know it’s January and July is a long ways away but it never hurts to ask early and often. 6) New Member Our newest Rebel owner Walter Foster is a long time sailor but had never heard of the Rebel. We told him that he gets a free one year membership in the NRCA. He said he is very impressed with the boat and wondered why it wasn’t a better known class? Gosh Walter, we are celebrating the 60th year of the first fiberglass one-design ever built and we will just have to do a better job of getting the word out. Welcome aboard. 7) Getting the word out. We would appreciate it if all of our fleet captains as well as anyone else with an e-mail list would forward our “Sailing News” e-mail to members of your fleets, perspective members, crews, family and friends. 8) Strictly Sail in Chicago What more can I say – it begins January 31st.